How Many Miles to London? Hopscotch dates back to the Roman occupation of Britain. The first thing to be done is to draw a course, several common court styles are seen below. Each player then chooses a marker, usually a stone. Play begins with the first player tossing his stone into the first space. If the stone lands completely within the designated square, the player proceeds to hop through the course. A player can only have one foot in any given square, so single squares must be balanced and double squares (side by side) are straddled. While hopping, the player should alternate the foot he lands on for each square. 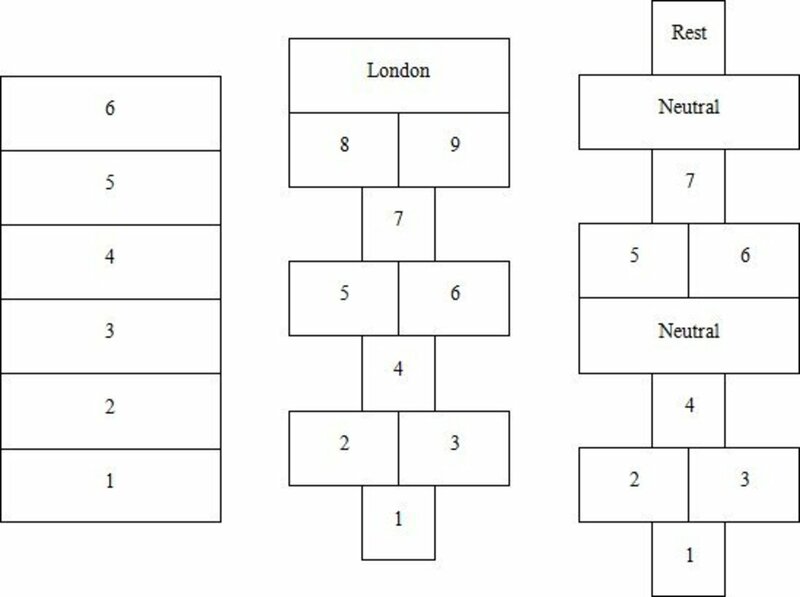 Any space not marked with a number, ie London, Home, etc., are considered rest squares and can be landed in any fashion. When the player reaches the top of the court, he then turns around and comes back, collecting his marker along the way. Play then continues with the player tossing his marker into the second square and so on. If a player fails to toss his marker into the correct square or if it touches a line the players turn ends. The same is true if the player steps on a line, misses a square, or loses his balance and falls. The first player to complete the course for each numbered square wins. Hoodsman’s Blind is known today as Blind Man’s Bluff. The person who is “It” is blindfolded or hooded and must try to catch any player that ventures too close. The other players see how close they can get to “It” without getting caught. The last person caught is “It” for the next game. Jingling is the reverse of Hoodsman’s Bluff. All of the players are blindfolded except “It”. “It” is given a string of bells and the players must try to catch him. The person who catches “It” is “It” for the next game. The game starts by marking an area on the ground by drawing a circle or other shape. “It” cannot leave this area. The players must try to run through the area without getting tagged. If a player is tagged, they must join hands with “It” and help to catch the other players. As more players get tagged, they join onto the end of the line. Only those at the ends of the line can tag a player. Those in the middle can however help to “net” the player as they try to run through. The last person caught is “It” for the next game. This game begins with “It” being blindfolded. The other players then stand in a line and ask “It” for directions. “It” tells them how many steps to take forward backward, left, or right they must go. Then “It” is led to the starting point and must follow his own directions. When “It” has reached the final destination, he must try to touch another player. The other players may duck or sway to avoid being touched, but they cannot move their feet. If a player is tagged, then he is the next “It” otherwise “It” must try again. This game has many names of which I have mentioned three. Each variation has minor adjustments in the rules, but essentially are the same. The equipment required for the game is 1 small white ball (about 1 – 1 ½” in diameter) and 2-4 balls of about 3” diameter for each player. The field is a flat stretch of ground generally 10’ wide by 60’ long (the distance can vary depending on the age and skill of the players). Play starts by throwing the small white ball known as a “Jack”, “Pallino”, or “Cochonnet”. The ball must land at least halfway up the designated field to be in play. The players then take turns trying to roll their balls closest to the “Jack”. When a player succeeds in getting his ball closest, his turn ends. If a player runs out of balls before getting “Best Ball” then they must wait while the other players attempt to improve their positions. A player can get “best ball” in several ways. First they can simply roll their ball closest to the jack. He could also use his ball to hit another player’s ball away or one of his own closer. The player can also hit the jack causing it to move away from the other players’ balls. At the end of each round, the player whose balls are closest gets one point for each ball nearer to the jack than any other players’. Games are usually played until a score of 15 is reached.